Be the first to share your favorite memory, photo or story of Charlotte. This memorial page is dedicated for family, friends and future generations to celebrate the life of their loved one. March 17, 2019. Age 100. Resident of Fort Wayne IN, formerly of Farmington Hills and Northville MI. Loving wife of the late Mariano. Daughter of William and Clara Osborne. Proud mother of Chuck Oribello (Rosemary Cummings), Judi Thomas, Nita Mickelson, Maryann Muir (Jack), Rick Oribello (Candi), and Lisa Garvin (Scott). Predeceased by son George Strong, son-in-laws Ron Thomas, Charles Shaw, and Gary Mickelson, daughter-in-laws Patricia Strong, Carol Oribello, and grandson Kevin. Also predeceased by siblings Alfred Osborne (May), William Osborne (Jeanette), Patricia Casner (Milford “Casey”), and Virginia Parrish (Russell). Survived by many loving grandchildren, great-grandchildren, great-great-grandchildren, nieces, and nephews. Charlotte was a “Rosie the Riveter” during WW II because she was thin enough to fit in the wings of the planes. Charlotte’s greatest pleasure was spending time with family. 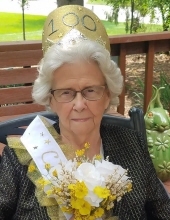 She enjoyed cooking, crocheting, crossword puzzles, reading, card games, bingo, and going to the casino. Charlotte will be missed by all. Memorial service will be held on March 23 at the RG and GR Harris Funeral Home, 15451 Farmington Rd., Livonia MI. Gathering at 10:00 am, service at Noon, followed by a Memorial Luncheon. In lieu of flowers, the family requests donations to the Visiting Nurse Hospice Home, 5910 Homestead Road, Fort Wayne IN 46814. Please share a memory of Charlotte on her Tribute Wall. To send flowers or a remembrance gift to the family of Charlotte Vivian Oribello, please visit our Tribute Store. "Email Address" would like to share the life celebration of Charlotte Vivian Oribello. Click on the "link" to go to share a favorite memory or leave a condolence message for the family.